The city of Hakodate, located on the southern tip of Hokkaido, holds a special significance for me. Although I've lived in Tokyo now for about 10 years, Hakodate is the city where I lived when I first came to Japan way back in 1998. In stark contrast to Tokyo's massive size and noisy, business-oriented lifestyle, Hakodate is small, quiet, and friendly. I lived there for one very enjoyable year before heading to the largest city on earth, and often wonder to myself why I ever left. 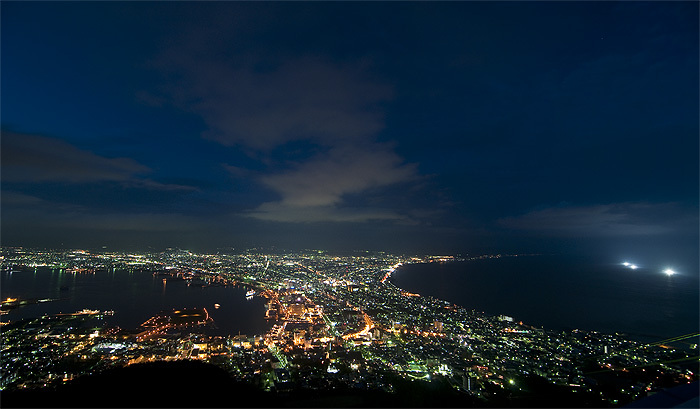 Hakodate's crowning glory is the view of the city at night from the top of Mt. Hakodate, considered not only to be one of the top three night views in Japan (the other two being Kobe and Nagasaki), but one of the top three most beautiful night views in the entire world. Though I've yet to see the views of the other two contenders (Hong Kong and Naples), I can personally attest to Hakodate's being awe inspiring. I've climbed the mountain at least 7-8 times now and the view never fails to impress me. Click on the photo for a larger version.